1-minute walk from Mishima Station South Exit. A hotel chain expanding 43 hotels nationwide. 12-6 Ichibancho, Mishima city, Shizuoka Pre. 1-minute walk from Mishima Station South Exit. 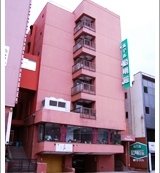 Has 85 rooms of Japanese and western style which accommodates 150 people in total. Best for sightseeing and business. Japanese bath with scenic view. Hall for maximum 80 people, parking lots for 40 cars. 11-14 Ichibancho, Mishima city, Shizuoka Pre. Only 1 minute from Mishima Station. A fashionable hotel with a café. 12-21 Ichibancho, Mishima city, Shizuoka Pre. Please get comfortable in the homelike atmosphere. There are reasonable capsule rooms in the annex. 14-1 Ichibancho, Mishima city, Shizuoka Pre. Only 5 minutes from Mishima Station. You can enjoy the view of Mt. Fuji from our natural hot spring bath. 3-18-33 Omiya-cho, Mishima city, Shizuoka Pre. Toyoko inn Mt.FUJI Mishima sta. From north exit of Mishima station only 1minute. Midnight price from 23 o'clock every day. 1-5-7 Bunkyocho, Mishima city, Shizuoka Pre. Best for business. A quiet and family-like hotel. 5,000 yen per night including breakfast is a tempting price. 5-32 Kotobukicho, Mishima city, Shizuoka Pre. Japanese Inn with homelike atomosphere. 7-15 Kotobukicho, Mishima city, Shizuoka Pre. We will welcome you at our family-like and quiet hotel. Extended-stay is welcome. 7-17 Izumicho, Mishima city, Shizuoka Pre. The hotel with murmur of a brook and comfort, while the hotel is at the centre of the city. So good for leisure and business. We have Japanese style and western style rooms and can accept banquet. Registrated hotel as the senior-friendly hotel. 1-13 Hirokoji, Mishima city, Shizuoka Pre. The hotel at the centre of the city. Mishima Taisha Shrine, Rakujuen Park, and Sano Art Museum are only five minutes walk away from the hotel. 14-31 Honcho, Mishima city, Shizuoka Pre. Our hotel is best for business trip, and we will welcome you like our own family. 4-6 Chuocho, Mishima city, Shizuoka Pre. 1 minute walk from Mishima Tamachi station of Izuhakone railway. Family-like and quiet hotel. Staying for business and extended stay are welcome. 3-51 Kitatamachi, Mishima city, Shizuoka Pre. A hotel with superb view of Mt. Fuji. We have complete confidence in our dishes and will accept banquets, parties and weddings. 1-1 Kawaharagaya, Mishima city, Shizuoka Pre. Want to relieve your daily tiredness in hot springs? The red hot water will warm your heart. 13 Takekura, Mishima city, Shizuoka Pre.